Two sweet stories that struggle to engage are thrown together in a lightweight souffle, inoffensive to the taste but rather quickly forgotten. 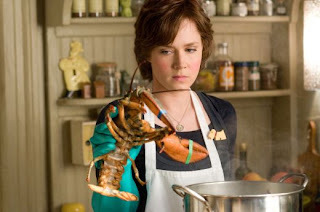 Julie and Julia intercuts the stories of Julie Powell (Amy Adams) and Julia Child (Meryl Street), both based on true events. In the late 1940s, Julia Child arrives in Paris with her diplomat husband (Stanley Tucci). She is quickly enamored with French cuisine and takes lessons at a prestigious cooking school. Eventually she befriends two French women who are also fans of cooking, and after years of effort, they publish Mastering The Art Of French Cooking. The book becomes a bestseller and establishes Child as the guardian cooking godmother of American housewives. In 2002, Julie Powell moves to Queens, New York with her husband (Chris Messina). Julie is turning 30 and a once-promising career as a writer appears to be passing her by. To break out of a psychological funk, she starts a blog and commits to cooking her way through Child's entire book within 365 days. She establishes a mythical connection with Child, and her blog chronicling her cooking experiences gains a wide following. Powell gets through her year of cooking, and writes a successful book about the experience. 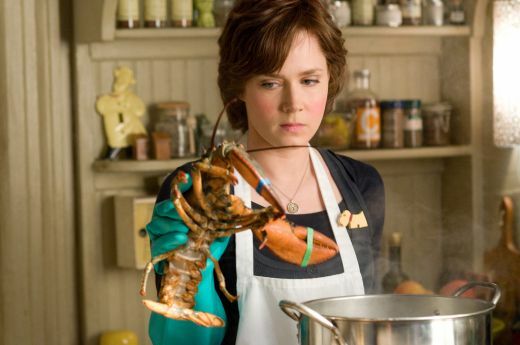 Julie and Julia is shallow as the white of a single egg spread out in the frying pan. The script, by director Nora Ephron, tries desperately to inject some drama into the proceedings, so the squabbles of Julie with her husband, the pressure of Julia's husband changing jobs, an overcooked meal, and a missed dinner appointment become large storms in a small teacup. The film is saved by the two central performances, Streep holding nothing back in portraying Julia Child as a larger than life and never deflated character, while Adams has the more difficult task of creating a likable character out of the modern-day Julie, who essentially does very little other than cook for the entire movie. Both actresses are eminently watchable, and they almost succeed in covering up the almost complete lack of substance elsewhere in the movie. Julie and Julia is a modest appetizer at a restaurant that serves no other course.